Somehow or other a chief editor must write some reviews, especially those concerning significant products. For hotheads I would note that the word significant have both positive and negative connotation. Sometimes the very product appears less interesting than intrigues surrounding it. You can find technical specifications on a specification page, and detailed description is available in the main review. And here read about the appearance of the WOLF5 project, who is responsible for its characteristics and what this device implies to a customer. It's an open secret that many people have been waiting for the device since the first specifications accidentally leaked out into the network. And the company's worshipers dreamed that appearing on the counters the model eclipsed all solutions by other makers. Only now and for the first time - the restriction of low-resolution is gone, the display is QVGA, UMTS is supported, an integrated GPS receiver is integrated, as well as a 2MP camera, and finally FM-radio with RDS. A complete kit, and even more, as the body is relatively small, business functions are traditionally attractive, and we mean the phonebook and organizer. And the fact nobody knew which operating system ran the handset excited masses. Symbian and Linux were the first pretenders, however some people supposed a third variant. PR managers achieved necessary success by revealing information before the official announcement, masses spoke about it, rumors endowed his handset with all conceivable advantages, and thus people were looking forward to Siemens SXG75. Fantasies concerning the device are so numerous that even full information available today can't make many users consider its components sensibly. And still the operating system, hardware and software capabilities remain a mystery for someone. 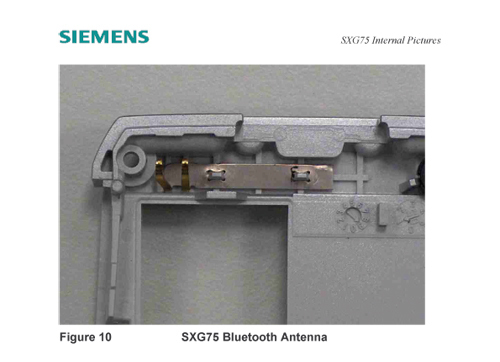 Then let's highlight this question together and understand what Siemens SXG75 is. Observing the past, Siemens has never had own UMTS-terminals and thus used Motorola's solutions. The A-series copies distinguished with design, a little bit with specifications and certainly MMI (the appearance of the menu, interface). Original Motorola's models untouched by Siemens' engineers formed the base. Then the company only shipped such phones, and all service and production still rested on Motorola's shoulders. 3G networks developed and Siemens' required own solutions. But they lacked experienced engineers and couldn't win the over from other companies, which made developing own innovations in this field almost impossible. In the middle of 2002 Siemens Mobile started searching for possible solutions of the problem and committed negotiations with Motorola, the theme was licensing Motorola's solutions in future. However the participants failed come to the point, among them - deducted sums, models that would be represented by Siemens and as a result now any collaboration got impossible. Siemens also was unpleased with using SkyWorks hardware platform even when Qualcomm's solutions seemed obviously more attractive (the same functions but in smaller size, which in the end influenced the actual dimensions of the terminal). But Motorola's contract with SkyWorks lasted for the middle of 2006, and breaking it would bring high forfeits. Motorola's analysts were mistaken predicting fast development of 3G in Europe, and that is why the contract with SkyWorks got so unprofitable. On the contrary, Siemens was free to choose a hardware supplier. Having received Motorola's vision of UTMS development (even in specifications of perspective models like Pictor, which is known as Motorola E1120), the company rushed to form its product line. High sales proved the popularity of candybar shape and that is why this form-factor was selected the main. On that stage Wolf5 had rivals in other form-factors; however the following success of Motorola E1000 made them focus only on the candybar factor. At the scheduling stage WOLF5's specs were equal to Motorola Pictor's. And the main difference was support for radio, not planned in Motorola's products at all. The companies parted completely in spring 2003, and since then Siemens' developers have had no access to Motorola's works. And at that moment Motorola decided to get rid of an integrated hardware GPS receiver in the Pictor. Experiments revealed a problem - three antennas couldn't co-exist in the handset, we mean one for connection, a GPS and Bluetooth antennas. In every new configuration some of the components failed, and small size prevented from making a perfect solutions (though, the Pictor's body doesn't look small). Low popularity of A-GPS in Europe was one more reason for refusal. Only few operators provided A-GPS, and as a result the number of services for usual GPS seemed small in the forecast for 2005-2006. And that is the point when the two companies part completely; each one follows its route in making products. Using Motorola's experience and marketing researches, Siemens starts making an own original product. The company faced many hard questions, which included the absence of own element base for 3G phones, a necessity of making own software - either own OS or licensing third party development, actually they are not numerous. And short time was given to solve these questions. At that very moment the company of Qualcomm, a leader in making chipsets for 3G devices, announces a new solution Qualcomm MSM6250. And customers were to receive the first test samples in the beginning of summer 2003. And formally this seems ideal for Siemens. The company makes its final decision pushed with the fact that Qualcomm plans Linux support on its chipsets and carries out necessary developments. And particularly, a MSM6250 family and following solutions were to work on propriety-version of Linux fully, which would shorten development period and decrease the costs. The companies start collaboration in the summer 2003, and in September Siemens achieves a hardware realization of the MSM6250 and thus the project enters the key stage. The agreement tells that Siemens receives not only the chipset, but access to works on implementation of Linux on it, also a BREW platform primordially available for the MSM6250 with Java support and MMI development (which is fast interface making for a device). The company works in several directions, one group deals with hardware part and the second one joins hardware capabilities sand the interface. In autumn 2003 software designers faced a hard question. They were to decide whether to make an interface in the style of prepared 65 and 75 series models, or refuse it and start the design from nothing. The marketing department gives the plainest solution - all models should look the equally, the menu, icons and their appearance shouldn't differ. Some developers tried to prove that 240x320 pixels screen resolution appear useless then and can't reveal all its capabilities, however they were not accepted. Engineers fought for special interface for 132x176 pixels screens and separate developments for phones with 176x220 screens and higher. User characteristics improve with such division on two lines, however development costs and time raise, also puts more load on post sale service (service support, manuals and so on). Considering that in 2005-2006 its own product line will contain minimum of high resolution models, the company refuses special developments for such devices. At the same time Siemens engineers whose belief in own power was always groundless promote an idea of using integrated capabilities of the chipset, which means the implementation of fully-functional GPS. Despite Motorola refused GPS navigation in the majority of its models (A-GPS) and was waiting for next generations of hardware navigational solutions, Siemens decided not to look back at rivals and create own solution. And even when operators showed interest in only A-GPS services (then they could charge for the service), the company did not change its route. Even the fact that engineers failed to provide prior work of the GPS receiver (fast start, good sensitivity and so on) could not influence the decision. 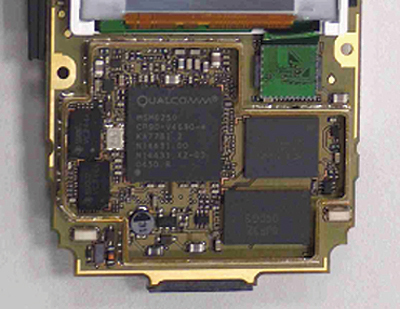 Then an integrated GPS receiver deliberately lost to external ones with integrated Bluetooth modules, which allowed data transmission to various devices including a phone. In fact we saw no logics in this solution, but remember Siemens VDO, which is an automechanics and navigation department. And the company possessed with two products relating phones - MN2100 and MN2200. 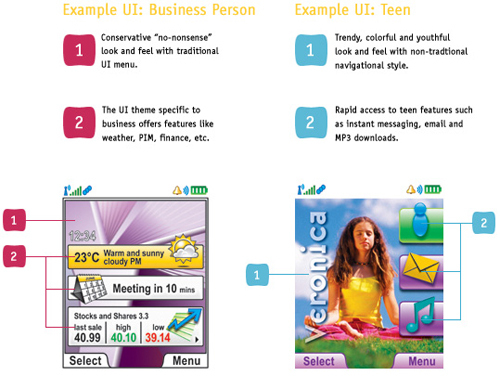 The first one is a software item for Symbian smartphones, and the second one is for usual Java MIDP 2.0 phones. However there is no actual need in an integrated GPS receiver, you can use an external one and obtain data via Bluetooth. However the company's service covers not all Europe, but only some countries, and the best coverage and more information about Germany. The device provides current position data, and a user enters the destination point. The company's server transfers the route or maps if necessary to the user's device. All maps are stored on external memory cards, but not in internal phone memory. You can pay for each requested route or monthly subscription. Receiving runtime data, the program can warn about necessary turns, the route, and navigational mistakes. The coverage is restricted dependant on the country, which gives a general view of Siemens VDO's position on the market, which obviously gives way to the same TomTom. 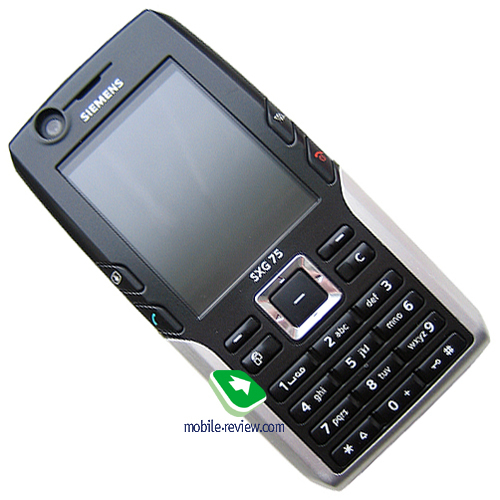 In fact, Siemens VDO works with the most popular devices, and as a result besides two Siemens' phones the advertisement on the company's site shows Sony Ericsson K750i (this phone allows using the service for sure). 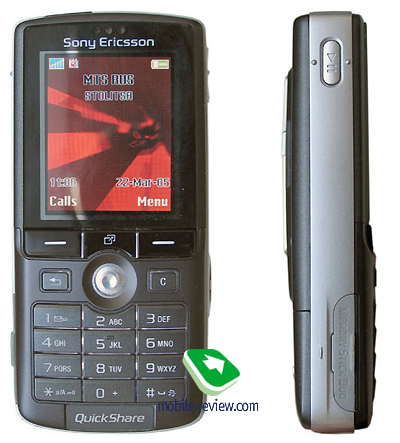 A curious fact is the company has stolen a picture of Sony Ericsson K750i from our review, changed the screen photo, put shadow and made the colours brighter and darker. However abrasions, reflections and dust remained (to tell the truth, that is my own phone, by the way…). I find it "pleasant" that the company's business ethics allows stealing another's pictures in such a key. Though the company has got used to "borrowing" successful discoveries of other makers, do not be surprised at some picture. That's only nonsense, but this represents general business approach of Siemens. A GPS antenna is placed by the top end of the phone, which partly improves sensitivity, but still not the whole situation. But at the same time, a usual antenna is moved down, which makes you close it with your hand and influences the quality of connection. 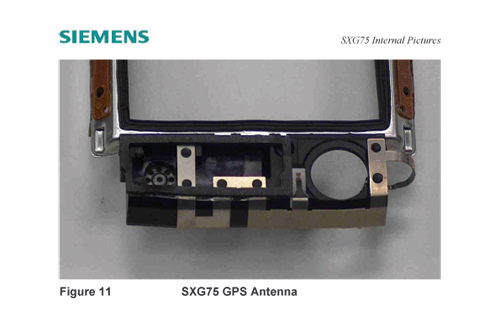 Here is how antennas are placed in the SXG75. In the end we can ascertain middling realization of GPS in SXG75, which points out that the handset, is more a demo version of Siemens VDO Dayton's services, but not more. Despite the manufacturer claims optional support for A-GPS, we can assure you it is absent now. And I see no need in the SXG75 in the presence of the same services for usual phones with external GPS receivers. All mobile phones are run by this or that operating system now, however their titles remain an empty phrase for end-users. Just ask your friends what Nucleus is, and you are unlikely to hear the answer. And that is al different for Linux, which was a flag of open source followers. Many PR-actions, pompous announcements, fight with Microsoft or only its semblance made this OS very popular. Just ask your friends about this OS and you are likely to hear a clearer answer. Some journalists try to carry their erudition on mobile sphere, and claim that for the first time Siemens used open source operating system, which allows programmers get access to its capabilities. That is completely wrong, as the majority of mobile terminals use closed Linux versions. Manufacturers do not have to open the codes of the system. And comfort for programmers here means programming medium known by desktop solutions. BREW and hardware acceleration for Java always were Qualcomm's peculiarity. Also a 3D chip responsible for processing multimedia data and 3D scenes is integrated. However it makes installing of more powerful solutions line ones by NVidia excessive and sometimes impossible. This product and platform do not have great future against the background of wide integration of 3d accelerators with high productivity, and will probably fix on this level. At first sight long development resulted in many strange solutions. For instance, a memory card. MMC-slot is integrated into the chip, and the manufacturer decided not to change the format, but replace it with RS-MMC (with smaller depth). The task was solved plainly - they just equipped the model with a card holder filling the empty room. As for me, they'd better keep MMC not rushing for diminutiveness, however here is it still borrowed. A corporate package uiOne is a BREW development by Qualcomm. It allows making own interface types fast, grouping functions and making various menu appearance. You can check the maker's interfaces on the picture. They are much more interesting that ones in the final Siemens' product. We can explain it with no desire to spend money and time on the development of such interfaces, which would be unique for low-end and expensive phones. To let our readers understand the facts above, we will repeat the main points. Propriety-Linux is an OS, BREW is a development above the OS, and Java is realized on the same level (above BREW). The interface is also based on BREW. That means Siemens adjusted present capabilities for its necessities. Standard functions of the phone absorbed many changes, among them voice dial for 100 tags (theoretically voice dial had to be independent on the speaker's pronunciation), unlimited number of groups, quite different sorting and phonebook organization. However, thanks to the developers, they tried to implement all functions on the level of the leader Siemens S75. Disadvantages that later will be improved are SIM Access profile for Bluetooth, though it is present in USER Agent Profile, but still is lacking in a real device. Phone's multitasking and background work of the majority of applications including an mp3 player should be considered as good innovations. This phone support various multimedia formats promised and unrealized in the S75. EDGE is not and won't be supported. I would like not to describe all changes, as the key ones have been mentioned above, and others are in the review. To tell the truth, we consider the previous Siemens' experience and thus can assure you that the model won't work stably by the start of the sales in the middle of January (that is like a belief in fairy-tale heroes). Small irritating roughnesses will be observed within the first months, sometimes the phone will restart. The maker now experiences significant fall of sales, and thus refused the maximum margin strategy, Siemens S75 is the first example (300 USD at the release moment). Siemens SXG75 will cost about 400 Euros, which is quite acceptable at first sight. On the other hand the presence of a new platform means the companies will spend much time developing it (the 65 series was developed within a year). And in the period of transition we should not expect serious efforts focused on it. The delay of the release is caused by software developments in the SXG75. But the manufacturer cannot postpone anymore, and that is why the phone will be launched in the present degree of fabrication. If not considering that dubious advantage called integrated GPS, we can list many rivals. They are the same Motorola's solutions, for instance, Motorola V3x which popularity grows rapidly. The latter model is comparable with the Siemens' product in camera capabilities in usual mode. 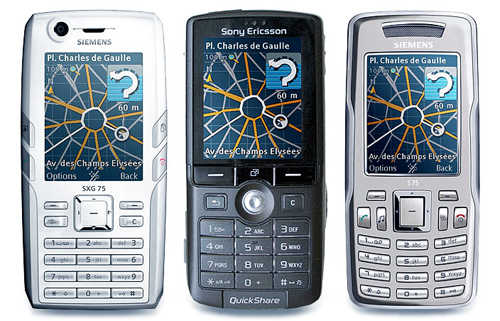 However the camera of Sony Ericsson W900i is much more interesting and better, like Nokia's ones. 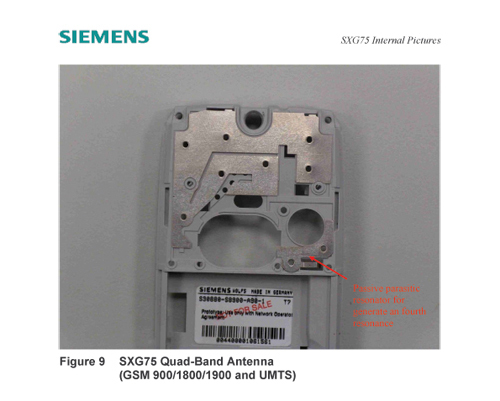 In general, there is no shortage in the UMTS segment for the moment, and unfortunately, Siemens SXG75 offers nothing new. Some loyal customers will support sales rate, however it has lost the fight for the market. The model would be relevant in the middle of the year 2005, and now it is not. P.S. The manufacturer refused Motorola E1120, which was a prototype of the SXG75, as it was considered too weak to meet the market demands, and unable to compete with Nokia's models.